I am a lucky owner of the IBM PC version of Bank Street Music Writer, which I purchased in 1986 using $85 of saved allowance through a friend’s older brother who worked at Babbage’s and could get it at a discount (normal cost was $150). The Ad Lib Computer Music System wasn’t available yet, and for $245 I couldn’t have afforded it anyway. $150 was a lot for a consumer-oriented music composition program, and with good reason: It came with a sound board. For the owner of a PC jealous of nearly every other home computer that came with decent sound hardware built in, this was the holy grail in a software box to me. The software and packaging called it the Bank Street Music Writer card, and it was capable of six synthesized voices with different instrument types, some of which could be percussive. If that sounds a lot like the Ad Lib, don’t be fooled — the output was square waves, the volume envelopes were controlled by the software, and the percussive sounds were made by mixing white noise with a waveform. It sounded a lot like two PCjrs glued together. Apple users are familiar with this sound: It’s the Mockingboard. The PC board doesn’t say anything like that on its PCB, and the components aren’t arranged the same way as they are on a real Mockingboard, but it sure sounded awfully similar. So much so, in fact, that I pulled my card out of storage a few years ago to see if I could decipher it for adding support for it in MONOTONE. I discovered it was built around a GI AY-3-8913, which itself is a smaller pincount version of the AY-3-8910, which was, in fact, the main chip on a Mockingboard. But that was the only connection, and it was mostly conjecture on my part. Well look at that — it is a PC version of the Mockingboard! 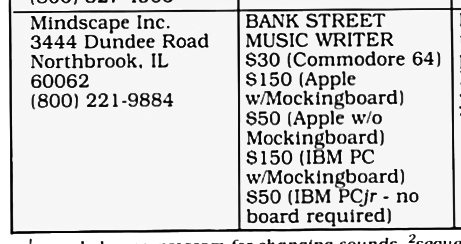 So at some point there was going to be a PC Mockingboard, but the only fabrication of it was as the “Bank Street Music Writer Card” bundled with Bank Street Music Writer. You don’t see this written in any Mockingboard/Apple history, which is a shame because I’d be curious to know what the plans were and how far they got off the ground. All we have proof of, thanks to Family Computing, is that they were planning to market it as a Mockingboard at some point. This is easily the rarest sound card I have in my collection, and is probably the most rare and valuable PC sound card second only to the Innovation SSI 2001 music card, of which only two are known to still exist. (Only one BSMW card is known to exist — mine — but remember the first lesson of the collector: Rarity != value.) And the Innovation has its own trump card: It’s a PC version of the SID. 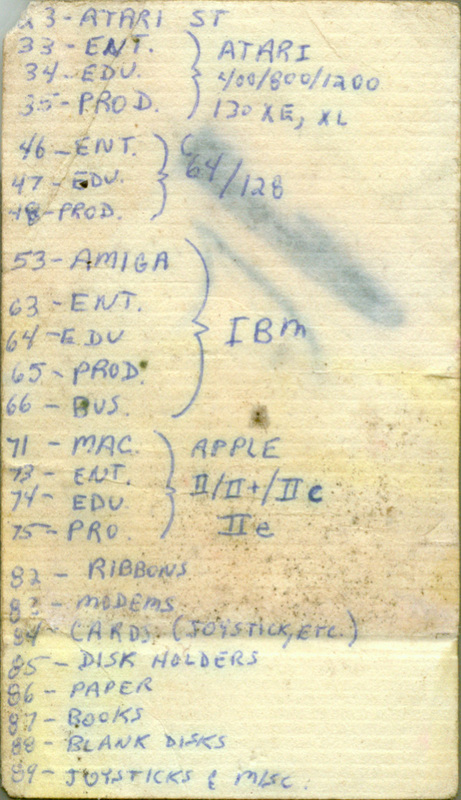 Scans of this card, reference samples of its output, and my interview with Glen Clancy about Bank Street Music Writer and it’s music file format will probably be inaugural entries in my Sound Card Museum project, which I will start building before the year is over. If you can’t wait and want to hear what it sounds like right now, you can check out both a sample file that came with BSMW, or a piece of music I transcribed myself (a section of “Consider Yourself” from Oliver). Just a quick note that Slashdot posted a main-page post about software collecting, one of my oldest hobbies. I personally weighed in, of course.